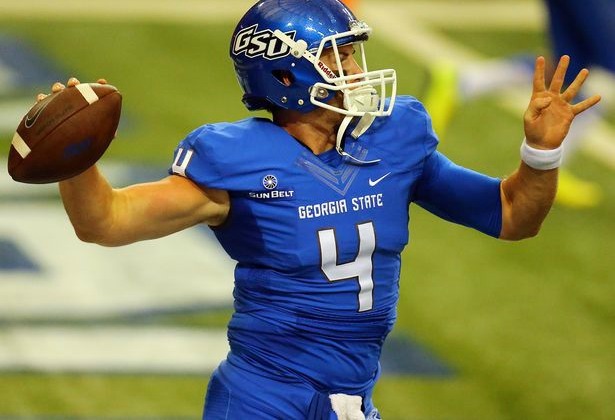 Georgia State needed a change of scenery after losing two of its first three games of the season. All three games were played at the Georgia Dome and after winning the opener against Abiline Christian, the Panthers lost to New Mexico State in the final minute and they could not keep up with the offensive attack of the Air Force Falcons. So the Panthers made the long road trip to Washington on Saturday to face the Huskies. And while the Panthers were a huge underdog, they were up 14-0 after the first half. But the Huskies woke up in the second quarter and end up rolling past the Panthers 45-14. The Panthers took it to the Huksies the first 30 minutes as quarterback Nick Arbuckle threw for 184 yards and two touchdowns. And the Panthers were still leading 14-7 late in the third quarter until quarterback Cyler Miles threw a 10-yard touchdown pass to Kendyl Taylor. After that, it was all Huskies. On the ensuing play, the Panthers fumbled and the Huskies scored again four plays later thanks to a Miles 3-yard touchdown pass to Kasen Williams. Miles would throw another touchdown pass early in the fourth quarter to make it a two-score game. Then the Huskies would go on to score 17 more points via offense, defense and special teams. One of the main reasons the Panthers collapse in the second half was the turnover. Arbuckle, who looked flawless in the first half, threw three interceptions in the second half and one was returned for a touchdown. He finished the night 21-of-33 for 194 yards. Donavan Harden had a season-high seven catches of 64 yards. Lynquez Blair, Avery Sweeting and Robert Davis each had four catches. On defense, linebacker Joseph Peterson led the Panthers with 14 tackles and two sacks. Tyler Payne, who was making his first career start at linebacker, had 13 tackles, one tackle for loss and one forced fumble. The Panthers (1-3) are off next week and will return to action on Oct. 4. The will travel to Lafayette, La. to face UL-Lafayette. 2015: The Year of Desmond Trufant?